The Screen to Save Initiative aims to increase life-saving colorectal cancer screening rates in communities that need it most. Colorectal cancer is the fourth most common cancer in the United States and second leading cause of cancer death. People age 50 and older from racially and ethnically diverse communities have lower screening rates than the general population. Screen to Save provides tailored education and outreach that increases access to resources for those who are disproportionately affected by colorectal cancer. 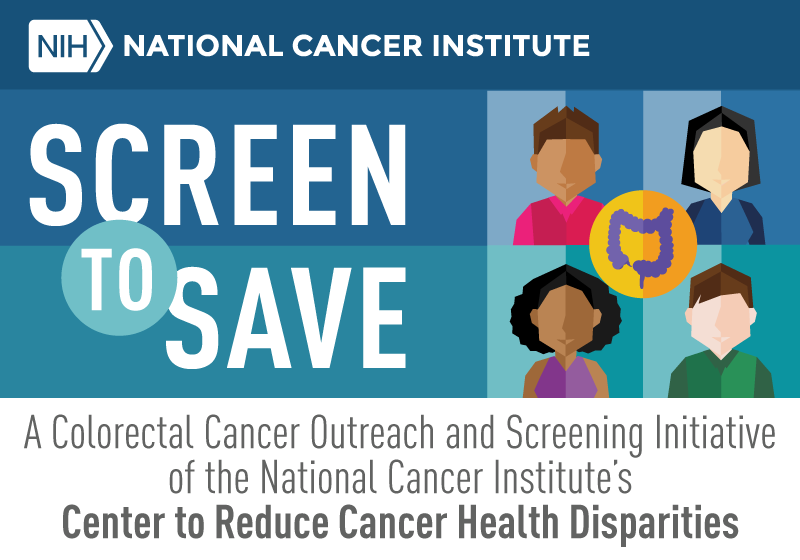 As a part of Screen to Save, NCI-supported community health educators are working with a diverse partner network to deliver NCI-approved colorectal cancer screening information nationally and locally. Join NCI community health educators and partners in helping to increase colorectal cancer screenings among men and women age 50–75 from racially and ethnically diverse communities and in rural areas. Help spread the word and increase colorectal cancer screening in communities that need it most. The Screen to Save social media toolkit contains sample social media posts and population-specific messages for American Indians and Alaska Natives, Asians, Blacks/African Americans, Hispanics/Latinos, and Native Hawaiians and other Pacific Islanders. Download a copy of the toolkit. If your organization supports Screen to Save’s vision to increase colorectal cancer screening rates among racially and ethnically diverse communities and in rural areas, you can show your support by adding this graphic and link to your website. Change the width in the above code to fit your needs. We believe that together, we can reduce colorectal cancer incidence and death and ultimately eliminate its associated disparities. Screen to Save is partnering and collaborating with organizations across the country that share our vision that everyone should be screened to save lives and that support increasing outreach, awareness, and linkages to care in racially/ethnically diverse communities and rural areas. For more information, please contact ScreentoSave@mail.nih.gov. Thank you to the partners and collaborators that are supporting this vision! These featured sites have recognized the value of Screen to Save and have chosen to collaborate with NCI to implement and promote the program in their communities. #ScreentoSave community health educators across the US are educating their communities about #ColorectalCancer.